I will never, ever tire of watching my little herd come running up to the barn. These days, they're so busy enjoying the tasty pasture grass that I have to whistle them home for breakfast. As soon as they hear me, the stampede starts. 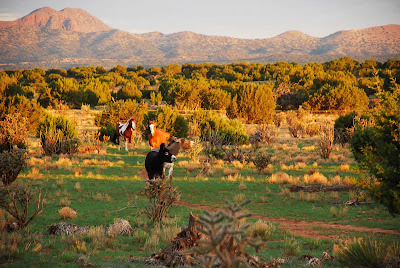 They race up the well-worn path that stretches from the far reaches of the ranch to the barn. 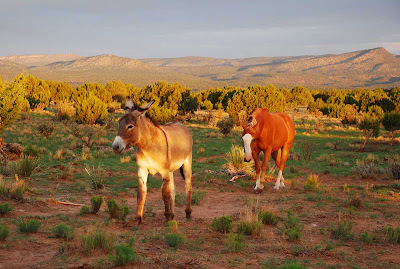 The burros run with their necks stretched out and noses up in the air, trying to catch the smells along the way. When every morning starts like this, it's impossible to have a bad day. My gosh, Linda, these photos are incredible! Great pictures. You have a beautiful place and wonderful critters. You're right how could anyone have a bad day when you can look at that scenery every morning! Gosh - 7MSN looks absolutely fabuuuuuulous with all the green grass. And, of course, the herd look like they're having such a grand time. Speaking of the herd - glad to see Deets finally has his photo in the sidebar! He certainly deserves it - as "leader" of the pack. Hi, I came over from Laughing Orca. It is fun to see all your critters but I especially loved the posts on your pig. The pedicure one was great as we have had the same experiences. After not knowing anything about them I can now say I love my pigs. It is fun to find another blog with a pot bellied pig in it. Your little herd is beautiful. I love that your animals and my children behave the same. Or maybe it's your children and my animals depending on how mine are behaving. There is so much color in your mornings! What kind of camera do you have? New Mexico = Enchanted, right? Great pictures. Our lot is much smaller - only an acre - but my gelding is usually in the back when I come out first thing in the morning and he comes running. Sometimes he's waiting right at the door when I open it. Betty's mare is almost always in her stall. She loves it in there. Those photos! I can see and feel what you are saying just by your writing and the photos. I can almost smell the feed. Perhaps I am becoming part donkey. My husband always tells me I am stubborn as a mule. You captured the lovely morning light perfectly. 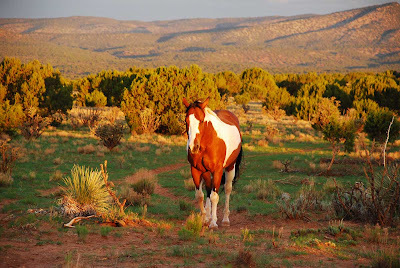 It highlights your equine critters beautifully. Nope, I wouldn't get sick of that either. Beautiful! I can't believe the grass is still so green! Beautiful photos! I love it when people love my pictures as much as I do. Thanks, everybody, for checking them out. Nuzzling Muzzles, my camera is a very recently acquired Nikon D80. Once again...you have done it!! Maybe I should have looked at this post sooner, if it helps chase away bad days (lol)!